Apartment 8, Chaucer House, Wheatley Road, Whitstable CT5 1FT. Brand new development on the site of the old sorting office. First floor apartment with a luxury finish with high quality fixtures and fittings. Large open plan living space with fitted kitchen to include oven, hob, extractor, fridge/freezer, washing machine & dishwasher, quality worktops. Double bedroom with fitted wardrobes. Bathroom with shower over the bath. Solid wooded floors with underfloor heating, double glazing. Allocated parking for one car and use of bicycle store. Flat 3 Robin Court, Tankerton Road, Whitstable. Just a couple of minutes walk to the beach, located in Tankerton this large two bedroom first floor flat will not be on the rental market for long. Boasting a good sized south facing lounge / diner with patio doors onto a small balcony. Separate modern fitted kitchen with built in oven & hob. Shower room with double size tray. Two large double bedrooms with wardrobes. Decorated in neutral colours with the added bonus of quality hard flooring throughout which is easy to keep clean and hygienic. Gas central heating & double glazing. Garage & parking with use of the communal gardens. Tenant admin/referencing fee: £85 per adult. Security deposit: £1300. Council tax band D ( 2017/18 - £1608.58 pa). Over 23's, Full time working tenants or maybe retired single/couple. No Pets or smoking. Sorry no DSS. 25 The Paddock, Canterbury CT1 1SX. Modern 2 bedroom end terraced house, fitted kitchen to include oven, gas hob & extractor, dishwasher. Lounge / dining room across the ear of the property with door to garden. Upstairs are 2 double bedrooms and the bathroom. Electric shower over the bath. Gas central heating and double glazing. 1 off road parking area, side access to the enclosed rear garden which has a small decked area and garden shed. Tenant admin/referencing fee: £85 per adult. Security deposit: £1345. Council tax band C ( 2017/18 - £1500.04 pa). Over 23's, Full time working tenants or maybe retired single/couple. No Pets or smoking. Flat 6, Rosiers Court, Canterbury CT2 8DA. A wonderful second floor flat in excellent decorative order throughout. Fitted with contemporary kitchen to include integrated white goods, fridge/freezer, washer/dryer, oven, hob & extractor hood. Two very good sized double bedrooms with fitted wardrobes. Large reception room with plenty of room for your lounge suite and dining table etc.. Shower room with white suite. Double glazing & electric heating. There is 1 allocated parking space which is secure and off road. Lounge/diner 4.3m x 5.8m. Kitchen 3.1m x 2.2m. Bed 1 - 3.0m x 3.7m. Bed 2 - 3.0m x 3.2m. Shower room 1.7m x 1.8m. Extremely well situated for the Canterbury West mainline station with fast train to St Pancras. The City with all it's wonderful amenities is just a short stroll from the doorstep. Tenant admin/referencing fee: £85 per adult. Security deposit: £1275. Council tax band C (£1429.85 pa). Let on an Assured Shorthold Tenancy (minimum of 6 months). Rent is EXCLUSIVE of all bills, unfurnished. Flat 3 Marine Court, Marine Parade, Whitstable. Fantastic location right on Tankerton seafront. This 2 bedroom first/top floor flat has recently had a total refurbishment so is in an excellent condition throughout. Fitted kitchen to include all white goods, solid wooden work tops. White bathroom suite with shower over the bath. Extensive views across the estuary from the lounge/diner which has a good sized covered balcony. The master bedroom also looks over the sea, with the added benefit of built in wardrobes. Gas central heating, double glazing. Garage & 1 parking space in private car park. Shared use of communal garden. Approximate room sizes. Lounge/diner : 5.2m x 4.0m, Kitchen : 2.5m x 2.6m, Bathroom : 2.4m x 2.4m, Bedroom 1 : 4.8m x 3.5m, Bedroom 2 : 3.5m x 3.5m. Tenant admin/referencing fee: £85 per adult. Security deposit: £1650. Council tax band D (£1608.58 pa). Let on an Assured Shorthold Tenancy (minimum of 12 months). A 3 bedroom semi detached house in quiet location at the end of a cul de sac. Sitting room with large bow window to the front, ajoining dining area with a door to garden. Newly fitted kitchen to include oven, hob, extractor and a dishwasher. Downstairs toilet. Bathroom with white suite and electric shower over the bath. Two very good sized double bedrooms and 1 single. Excellent decorative order throughout having just been completed, also all new floor coverings. Gas central heating, UPVC double glazed windows and doors. Offered unfurnished. Front and back gardens mainly laid to lawn with a small patio area at the rear. Driveway leading to brick built detached garage. Approximate room sizes :- Lounge:4.2m x 3.2m, Dining area:4.0m x 2.6m, Kitchen:3.6m x 2.4m Bed 1: 3.6m x 3.0m, Bed 2: 3.6m x 3.0m, Bed 3: 2.4m x 2.1m. Tenant admin/referencing fee: £85 per adult. Security deposit: £1650. Let on an Assured Shorthold Tenancy (minimum of 12 months). It is intended for long term. Rent is exclusive of all bills. Council Tax band C. (2017/18 £1429.85). 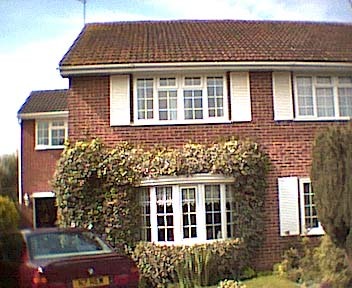 An extended 3 bedroom semi detached house. Situated at the end of a quiet cull de sac. This house has a very bright and airy feeling and is decorated to a very high standard. It has a good size sitting room with a bow window to the front. Quality fitted kitchen with built in oven & ceramic hob. Large 'L' shaped dining room which wraps around the kitchen to give a very pleasant family living area with french doors to the garden. There is also a 3rd reception room which could be used as an office or play room. Seperate utility room with back door out to the garden. Downstairs cloakroom. Upstairs there are 3 bedrooms and a family bathroom with shower over the bath. The master bedroom has an en suite to include corner bath, double shower and twin basins. Gas central heating, UPVC double glazed windows throughout. Integral garage. Parking for 3 cars. Front and rear gardens. Ideally situated for local schools including Herne Bay High. Approximate room sizes :- Lounge:4.5m x 3.5m, Kitchen/Dining area:5.2m x 4.5m, Utility: 2.4m x 1.7m, Reception 3:4.1m x 2.4m, Bed 1: 4.5m x 3.0m, en-suite 2.9m x 2.6m, Bed 2: 3.0m x 2.5m, Bed 3: 3.4m x 1.9m. Tenant admin/referencing fee: £85 per adult. Security deposit: £1500. Let on an Assured Shorthold Tenancy (minimum of 12 months). It is intended for long term. Rent is exclusive of all bills. Council Tax band C. (2018/19 £1500.04). Old Print Works Close, Whitstable, CT5 4GZ. Modern four bedroom town house set over 3 floors. Fully fitted kitchen with built in appliances to include oven/hob & extractor, fridge/freezer and a dishwasher. Downstairs WC/cloakroom. Lounge /diner with french doors to the low maintenance courtyard garden which has recently been paved. Four good sized double bedrooms, two on each floor. Family bathroom & seperate shower room. Allocated parking for 1 car. Gas central heating & double glazing. Within a very short walk to the town centre and the beach. Whitstable is brimming with places to dine and small boutique shops. Also mainline train station within easy walking distance.